Even though fall seems to be hiding around the corner, summer is still in full swing around here and that means I'm far from packing away a single pair of sandals. No matter how many times my husband shakes his head and asks just how many pairs I need laying out at one time, I just can't do it. At least not until the snow starts to fall. Having been introduced to the stylish and affordable options at Jenlinn.com back in January, this year I've been able to see that there are far too many cute looks to just stick to a simple pair of black flip flops day in and day out, right? However, seeing as there will always be a soft spot in my heart for those black flip flops, I was happy to see that Jenlinn was able to help me take them up a notch recently with their WALTZ-225 Flat Rhinestone Sandals. The perfect combination of simple, classy and elegant with a boost of bling to them, the WALTZ Sandals were exactly what I was looking for in something that would be comfortable yet attractive. As they match just as well with jeans as they do with shorts, skirts or dresses, putting them on manages to add pizazz to my outfits much more than a pair of plain flats (you can see me wearing them in my Tea Collection review. They go great with a casual dress)! As fashionable and chic a pair of heels can be, the WALTZ Sandals are a great alternative with dressy outfits when I know that I'm going to be doing a great deal of standing or walking. The smooth underside to the straps, unique overall design, and adjustable buckle mean that they are a perfect fit every time. If you have feet that require arch support, these might not be a great choice due to the lack of it, but so far I have found them quite comfortable! 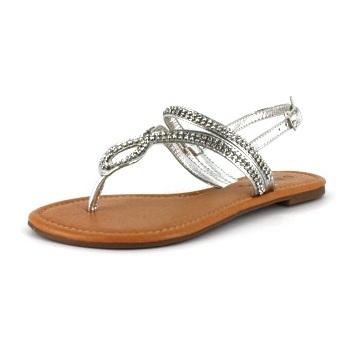 Available in a multitude of fun colors, the WALTZ-225 Flat Rhinestone Sandals retail on Jenlinn.com for $26.99, an affordable option compared to what you'll find in department or shoe stores. When it comes to combining style and versatility, Jenlinn.com just knows what works in women's shoes. With everything from flats to wedges to pumps, their massive selection is sure to have what you're looking for, whether for everyday or a special occasion. And when it comes to that everyday casual style that you're going to want to slip on day after day, what would work better than the AMASS-2 and AMASS-3 Mid Heel Slip-On Sandals? 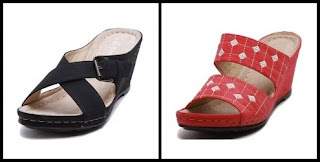 Available in the AMASS-2 X-cross version or the AMASS-3 with the cross bands and embroidered design, this line of sandals features a three-inch wedge heel and comes in a total of nine different colors. The soft, cushioned footbed ensures the ultimate in comfort and the synthetic lining and outsole will leave your tootsies happy no matter where you wear these shoes. Retailing for $25.99, the AMASS would be great to wear to work, running errands, out to dinner, hanging out with the kids, and more. Pick a neutral color like black, white or beige and they'll be a go-to pair of wedges for any number of outfits... or go with something more unique like the pink, red or purple and you'll be set to add a splash of color to brighten your day! With hundreds of styles available, the hardest part about shopping at Jenlinn.com is deciding on a favorite. Even though I have been visiting for months, each time I start browsing I find shoes upon shoes that I have never noticed before. Now I just need to come up with reasons to tell my husband that I need yet another pair! One lucky person will win their choice of ANY color of the ANY of the AMASS-2 or AMASS-3 Mid Heel Slip-On Sandals from Jenlinn.com! To enter to win: Visit Jenlinn.com and tell me which cute style of shoes (other than those mentioned above) you would most like to wear this summer. Giveaway will end on August 22nd at 11:59pm CST. Do me the favor of leaving an email address or making absolutely sure it is visible in your profile, I have to have a way to contact the winner. The winner will be chosen by random.org and announced here as well as emailed and will have 48 hours to contact me or respond to notification or a new winner will be chosen. This giveaway is open to U.S. residents only (no P.O. boxes) and the winner will be required to create an account on Jenlinn.com in order to redeem their prize. A big thank you to Jenlinn.com for providing a pair of WALTZ sandals for me to review as well as the choice of AMASS sandals for one lucky giveaway winner. The opinions shared are my own and honest and if you really need to see more, click here to see how I roll. I think that the W9193 Women Lace-Up Fashion Sneaker ||:Pink/White:|| is darling. I like ASTER-1 Women Mid Heel Platform Wedge Slip-On Sandals in Black. I would choose the Suede Cork Wedge Sandals ||:Black. I like the AMASS3 sandals in black. I love the Bettie Black Satin(Polka Dot Print) pumps. I think the W9193 Women Lace-Up Fashion Sneaker ||:Pink/White:|| us super cute! FS102 Leather Upper Women Flat Casual Shoes in Coffee. I love these! I signed up to jenlinn's email list. I entered the Edy's Ice cream giveaway. I entered the JC Penny giftcard giveaway. I entered the Peeps Company $20 gift certificate giveaway. I love the ASTER-1 sandals in black. I like the Black Attain 1 Sandals. I am loving the APPLE-4 Women High Heel Slingback Platform Wedges ! I follow Jenlinn.com on Twitter @AMLewis2003. I subscribe to Jenlinn.com's emails. I like the decorative fabric peep-toe pumps in ivory. I'd like the DAISY-09 Brown Pu this summer. I entered the Rubbermaid spray mop giveaway. I would love a pair of the Platform Wedge Sandals in Khaki to wear around this summer - Cuuuute!! I like the Suede Cork Wedge Sandals! I follow with GFC #1! I follow with GFC #2! I also entered the Rubbermaid Mop giveaway! I like the ATTAIN-3 Women Ankle Strap Flat Thong Sandals in pink. Entered the Stamping on Metal giveaway. I love the ACTIVE-1 Women Platform Wedge Sandals.